Microchipping your cat is important. Here’s why. It’s now a legal requirement to have your dog microchipped, but it’s still just a recommendation for cats and other pets. We think this cheap and quick procedure can make a big difference to cats and their families and it’s not fair that they aren’t given the same level of care as our canine pals! Pet ID microchips are computer chips that are encoded with a unique ID number. They’re about the same size as a grain of rice and are injected just under the skin between the shoulder blades. We can do this any time, and although the needle is bigger than one we use to inject liquid it’s generally no more painful for them than a vaccination. Puppies and kittens that are going to be neutered can be microchipped whilst they’re under anaesthetic if you’d rather combine the two procedures. 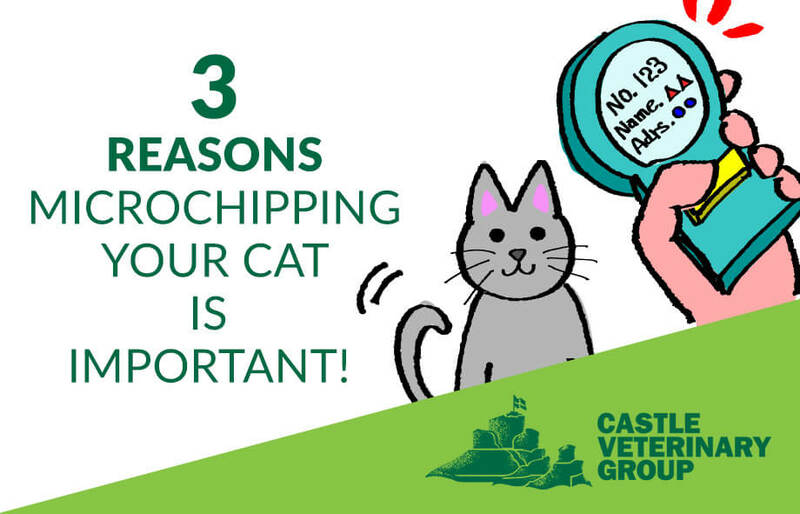 Of all the cats that are lost and taken into shelters, around 74% are rehomed if they’re microchipped compared to only 13 % of non-chipped cats finding their owners again. So that’s 87% of lost un-chipped cats never sleeping in their favourite spot in the sun or being tickled just where they like it by the people they love ever again. You might think that your cat will never venture far, but these are active, sensitive and curious creatures. There might be noises such as visitors, a new baby, fireworks or parties that make them run further away than normal and fail to find their way home. Cats might explore a neighbour’s shed or garage, then be taken to a vet once they’re found – perfect if they already have a pet microchip. Indoor cats are even more likely to get in trouble if they never explore their territory as they can quickly dash out of doors and through open windows and easily get lost in unfamiliar territory. At Castle Vets, we’ve had direct experience of this when a cat was reunited with its owner’s thanks to the pet microchip. How long had been missing for? 15 years! Collars with tags on, or the tags themselves, regularly fall off. They can also cause harm if they get stuck on a branch or caught on something whilst your cat is jumping, and the tags can become lost, outdated and illegible. 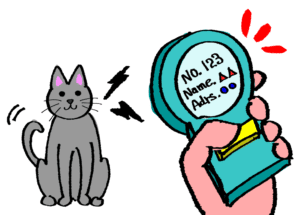 If your cat is taken, then a collar and name tag are easily removed so your cat stands no chance of being identified in the future. Microchips get over all of these problems and don’t cost much more than a collar and tag. There have been cases of chips migrating, but these generally just move around the same area (usually down a leg) so are found very quickly if they’re there. Technology has advanced to the point that some of the day-to-day items your cat uses can be tailored to respond to their individual chip. You can buy cat flaps that only open to allow programmed cats in, and these can be invaluable. Cats are highly territorial and can be really traumatised if a strange cat lets themselves into your house to torment them or eat their food. If that cat happens to be male, there is also a high chance they’ll spray inside your house too which is a smell that’s very hard to get rid of. If you have more than one cat in your household and they have different dietary requirements – for example, one is overweight and is on reduced calorie food and others aren’t, or if they are on a prescription diet, then you can buy food bowls that open only for each individual cat. This makes life so much simpler and ensures they only ever eat the food that’s right for them.